With a sleek design and an ambitious promise, stroller bike maker Taga raised over $7 million from would-be cyclists on various crowdfunding platforms. But somewhere along the road, things veered off-course — and now, hundreds of backers are left without the bikes they pledged for. So where did it all go wrong? And what can Taga backers do next? We’d like to talk about what happened to Taga and suggest an alternative for backers who haven’t given up their pursuit of a great bicycle. Back in May 2016, a company called Taga USA Inc. launched a Kickstarter campaign for the Taga 2.0: a foldable, three-wheel cargo bike designed with families in mind. The bike was a follow-up to Taga’s original stroller bike. To lower the price of their second model, Taga opted to make the Taga 2.0 a basic bike-and-box with optional accessories rather than a convertible stroller bike. But this change didn’t dampen consumers’ enthusiasm, and the crowdfunding campaign hit its fundraising goal in the first 24 hours. Following their Kickstarter success, Taga USA started a second crowdfunding campaign, this time on the Indiegogo platform. With Taga bikes and accessories promised as backer perks, over two thousands would-be cyclists pledged a whopping $4,978,397 to the new campaign. That’s when they hit a bump in the road. It’s not clear exactly when Taga’s financial troubles began, but towards the end of 2017, backers were increasingly airing their concerns about not receiving the products they were promised. By February 2018, it was clear there was a problem. Taga’s CEO published an update on Indiegogo to apologize for the delay and inform backers of the company’s “temporary cash issues.” Those backers who requested refunds were informed that none could be given at that time. Finally, on March 17, the saga came to a disappointing conclusion. The CEO of Taga USA Inc. made the last major update on Indiegogo, telling hopeful backers that the company was in an insolvency situation. Taga has now ceased all production, sales, and customer service, and many backers never received the stroller bikes and accessories they had been waiting for. So what can Taga’s backers do? Unfortunately, what happened to Taga leaves its supporters with little recourse. Product development and innovation is always a risky business. Indiegogo makes no guarantee that projects will succeed or that backers will receive the perks they were promised. With Taga USA Inc. on the brink of dissolution, it’s unlikely those people will ever find themselves at the helm of a Taga bike. Not only is this a loss for Taga’s backers, but it’s a sad situation for the cycling community as a whole. It’s disheartening to know that so many people who were eager to join the active transportation movement are being left in the dust. That’s why we’d like to take a moment to speak to those backers directly. We are Wike: the Walk and Bike company. For the past 25 years, we’ve been channelling our passion for cycling into creating products for people who want to make walking and cycling a part of their daily lives. We started with a single bike trailer model, the seed from which a wide line of cycling trailers grew and evolved over time. Today, Wike builds trailers that move cargo, haul kayaks and canoes, and even help adults with special needs hit the trails. We also happen to share Taga’s vision of a bike that lets parents transition from walking to cycling in a snap. Our stroller bike is the Salamander. The Salamander stroller bike is the result of five years of development and over two decades of expertise. We poured our passion for active transportation into building the fastest-folding convertible cargo bike in the world and now in 2018 we offer it across the globe. Here’s how it works. The Salamander converts seamlessly from a Dutch-style cargo bicycle to a double child stroller in a couple of seconds, making it a great solution for parents who want to take their kids on the go. But how does it size up to the Taga bike? While both fill the stroller bike niche, there are a few important differences between the Taga bike and the Wike Salamander, and we’ll look at these below. 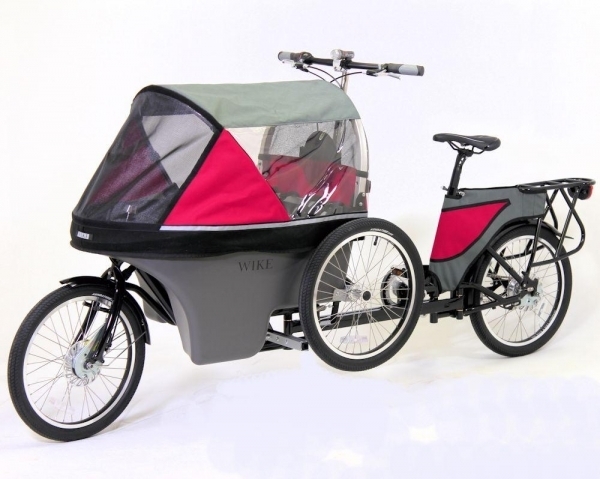 The Taga 2.0 cargo bike started at a price of $599 USD (which works out to about $755 CDN). However, the base Taga bike price did not include child seats, headrests, sun hood, accessory bar, or canopy. When you included the cost of one child seat and accessories, the Taga 2.0 cost $1,239 USD ($1,559 CDN). The cost of the Taga bike plus two child seats and accessories was $1,842 USD ($2,318 CDN). As for the Salamander? We’re offering it for an introductory price of $2,800 CDN all-inclusive. This price reflects the fact that we build the Salamander right here in Canada, and it includes the bike, canopy, two padded child seats and backs, and two sets of seatbelts. Unlike the original Taga bike, the Taga 2.0 does not convert from a bike to a stroller. Taga removed this feature from its second-generation model to pare down the cost. The Salamander, on the other hand, is a fully convertible bike that can go from bike-to-stroller or stroller-to-bike in 2-3 seconds. As for the original Taga bike, the Salamander stands out with the ability to go from bike or stroller and vice versa seamlessly. You don’t have to kick the kids out of their seats to do it — just release the lock, apply the rear brake, push the stroller forward until it locks, and raise the third wheel. It’s absolutely as easy as the video makes it look. There’s a bit of a misconception out there about the safety merits of three-wheel bikes versus two-wheelers. It’s true that trikes are easier to balance when not in motion. However, tricycles have two major flaws: three-wheel bicycles tip easily on uneven or angled ground, their narrow stance makes them tricky to handle on turns. This was a common complaint with the original Taga bike, and while the Taga 2.0 does improve on the design, it’s still a potential safety hazard. The Salamander solves this issue with a third wheel that raises when you switch from stroller to bicycle. With no third wheel holding you back, you can cut around corners easily and tackle slopes safely. We here at Wike have been building awesome cycling accessories since 1990! The quality of our service is just as important as the quality of our bikes, and we work hard to make sure all our customers are completely satisfied with the products we sell. So don’t let what happened to Taga keep you from joining the movement in active transportation. There are Taga alternatives out there, and we’re here for the long haul. We have units available in various colours in stock now. Check it out.